Finding a sustainable, long-term solution to supply water for our planned well program in the Montney play of the Western Canadian Sedimentary Basin was a complex process that required careful consideration of numerous variables. Limited local water options, seasonal availability fluctuations, transportation logistics, cost, and stakeholder concerns were all challenges. There were also limited options for produced water disposal, especially notable because the amount of water returned to the surface from wells during exploration and early appraisal was substantial. The remote location and proximity to local Indigenous Peoples added further levels of complexity. Simply put, resource development was dependent on a comprehensive, fit-for-purpose water management plan supported by local stakeholders. Our team first assessed the regional sourcing options for the entire lifecycle of the project. This included local rivers and dugouts, shallow groundwater, deep saline aquifers, joint ventures with other operators, and major regional rivers and reservoirs. There are no suitable deep saline water sources in the area and shallow groundwater sources and dugouts were found to be insufficient. Similarly, most of the local rivers flow seasonally and cannot provide water supply to operations year-round. The Williston Reservoir, the local Halfway River and the Peace River, a major regional river, were found to be the only viable choices. After detailed hydrologic analysis of 35 years of water survey data from Environment Canada it was determined that the Halfway River was the best option as a sustainable water source, with the added benefit of proximity to the ConocoPhillips lease area which significantly reduced construction footprint and development costs relative to the two other possibilities. Engagement with the Halfway River First Nation (HRFN) was a critical early step in advancing the option of using water from the river for hydraulic fracturing. Residents of the HRFN live close and actively use the river so respecting their community and personal water use was a priority. This included proactively mitigating possible impacts and minimizing possible disturbances, such as traffic through the community, the in-river construction footprint and noise from facility pumps. To facilitate informed conversation about the potential impacts to the Halfway River from our operations, we held numerous meetings with community leaders and held a townhall meeting with the broader community. During this engagement, an external expert fisheries biologist and hydrologist provided insights into the historical data from the river as well as monitoring plans that gauge the health of the river. Our staff also provided operational and construction details and answered questions from community members. We committed to monitoring flow rates of the river and to cease withdrawing from the river if rates drop to a specified low-flow threshold. A website will provide real-time flow rate information for company operational staff, and this information will also be readily available to the HRFN community. The river has a high flow rate and is a high-value fishery with a notable bull trout population, a species designated as Special Concern in Canada, so careful monitoring of the flow rates will provide protection of fish and aquatic resources. Extensive laboratory testing and a field pilot in 2016 validated that water produced from Montney wells would be best managed if treated prior to storage in engineered ponds and reused for hydraulic fracturing. The possibility of transporting water primarily by truck was quickly dismissed. Seasonal weather can cause roads in the area to be unpassable and the sheer volume of traffic, an estimated 250,000 water trucks per year during development, would strain existing infrastructure and increase road safety concerns. Our team decided that investing in major water infrastructure, including a pipeline system and a water recycling hub located at the central processing facility, would be the best sustainable long-term plan. 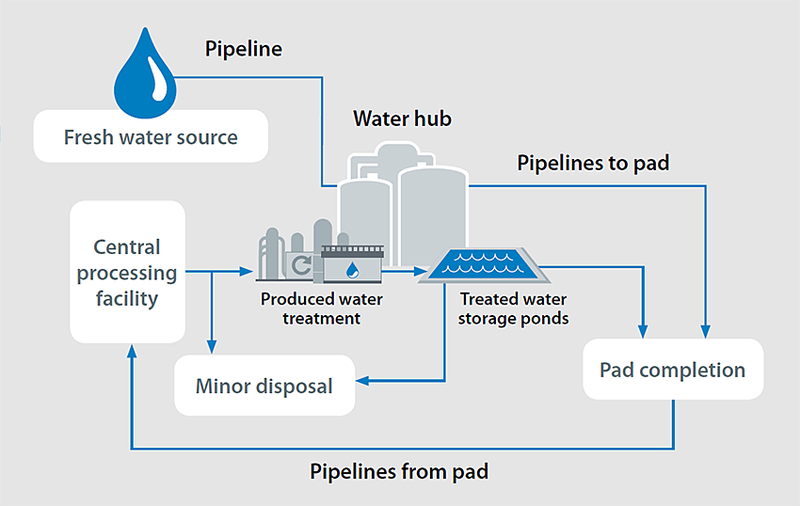 The closed-loop recycle infrastructure ensures water produced from a stimulated well can be treated and reused to stimulate another well, reducing the need for additional fresh water. Once water is transported from the river via pipeline into the hub, it is combined with recycled produced water and piped to the well pad for completion activities. Water produced from well pads is piped back to the water treatment facility for de-oiling, iron and solids removal, and clarification. The treated water is then stored in ponds with engineered liners and environmental monitoring to ensure ongoing containment and availability for future re-use. The benefits of this solution are that as more wells are brought into production and the volume of produced water for recycling increases, the amount of water pulled from the river to be used as make-up water for ongoing operations is significantly reduced. This commitment to environmental sustainability, while reducing associated water disposal project costs adds significant operational and project scheduling complexity that ConocoPhillips is uniquely positioned to manage through technical and operational expertise. Further benefits of this process have been passed onto affiliated First Nation construction companies, which have been awarded contracts for new infrastructure projects, creating local jobs and supporting the local economy.